On a recent press trip, the first St. Petersburg has ever hosted for American journalists, I visited several. Our group made the de rigueur visit to the Winter Palace, which is part of the larger Hermitage Museum, but we visited more. Peterhof and Catherine Palace, discussed below, often featured in typical St. Petersburg tour packages. They are two of the region’s five former imperial summer palaces; the others are Gatchina, Oranienbaum and Pavlovsk. A separate article discusses other less-well-known palatial sites. A summer palace built by Peter the Great early in 1714, Peterhof was destroyed by the Nazis and is still in the process of restoration. It is outside St. Petersburg and faces the Gulf of Finland. 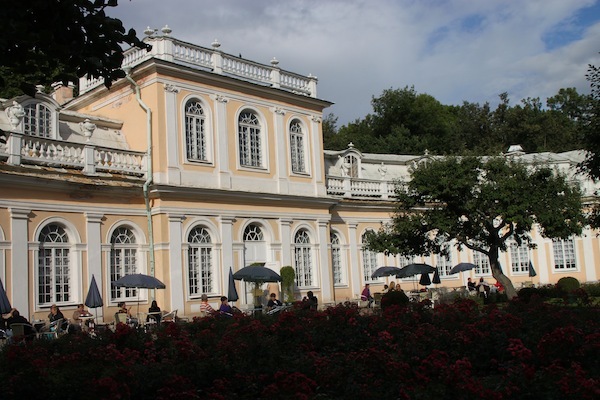 Mon Plaisir Palace, one of the palaces that comprise the Peterhof complex. 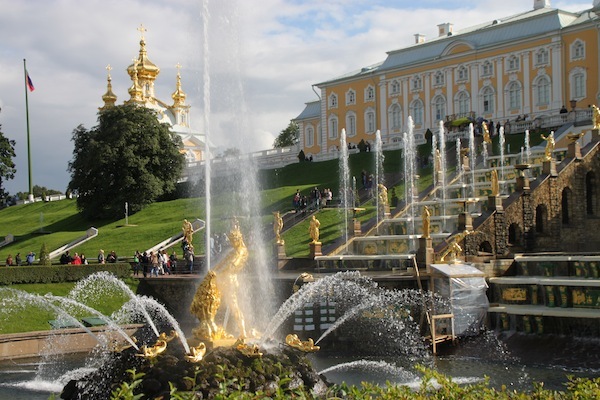 Visitors can go inside the Grand Palace at Peterhof, but for our short visit, we concentrated on the Lower Park (near the gulf) and the feature for which Peterhof is best known — its fountains. The most dramatic of the lot are on a slope directly in front of the Grand Palace. Some of Peterhof’s 150 fountains with the complex’s Grand Palace in the background. Peterhof has 150 fountains and four cascades. The fountains work without pumps. The water comes via a system of canals and pipes from lakes 26 miles away. Visitors can see these fountains in action from early May to early October. At other times, due to freezing weather, the pipes have to be shut off and drained of water. In season, fountains operate from 11 a.m. to 6 p.m. daily. These fountains earn Peterhof the sobriquet, Versailles of Russia. 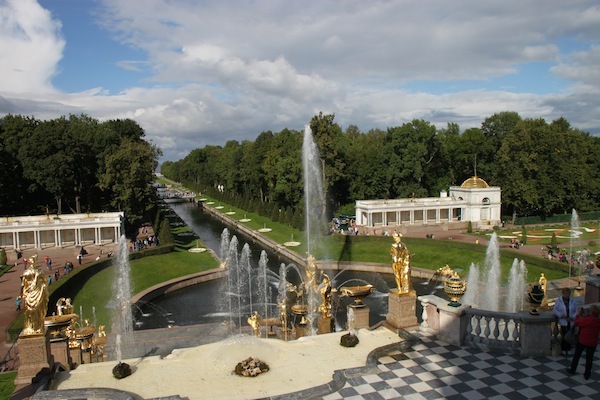 View, from the terrace of Peterhof’s Grand Palace, of several fountains and the Marine Canal which connects the property to the Gulf of Finland. There is a lot of gold on statuary and other elements of fountain design. Our guide said the outdoor gold features here have to be regilded every three to four years. Our tour took us to Fountain Road. Three times daily, at announced times, the park demonstrates the tsar’s trick fountains here. This involves 300 jets across the road, 150 from each side. I had seen a different trick fountain in operation on a previous visit. Peter evidently was a bit of a prankster. 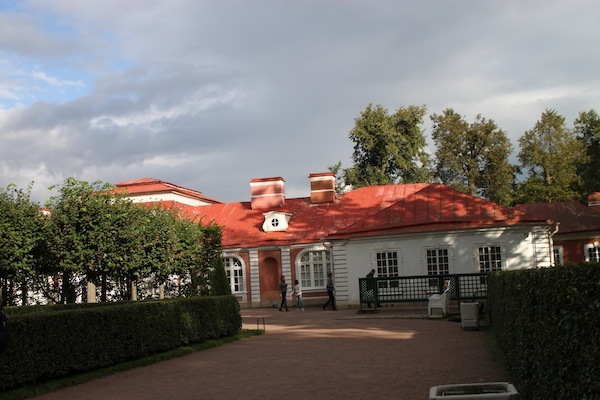 Besides the main summer palace, the grounds at Peterhof comprise another seven former palaces and four parks, with the total covering 386 square miles. There also are eateries on the grounds. We lunched at one called the Standard, in the Lower Park. 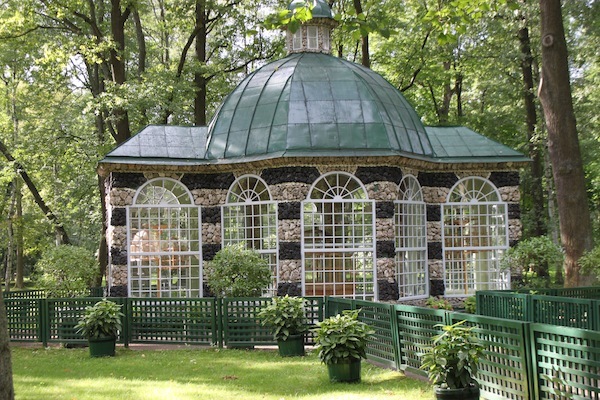 The Orangerie Restaurant on the grounds at Peterhof.